Dec 03, 2015 We appreciate your feedback and regret that your wife’s birthday celebration did not go as planned. Your reservation was cancelled when you arrived at the resort and presented a temporary ID, which violated the resort’s Terms and Conditions. As clearly stated in writing, any violation of the Terms and Conditions set forth by the resort voids the promotional package price. Neither the resort nor BookVIP could have anticipated that you had a temporary ID as it was not made clear that you were not US/Canadian Citizen or permanent resident. However, we did not charge the penalty and also gave you a 100% refund. Our special promotional packages are sponsored by the resorts and the rooms are discounted up to 80% because the resort is subsidizing the room in exchange for your time during the resort preview. All qualifications, resort fees, taxes, deposits and penalties for any particular property are clearly stated on the Terms and Conditions governing each vacation package. To ensure that a potential customer is eligible and qualified to participate in the special promotion, the Terms and Conditions are reviewed with the customer during the sales call and the customer must accept and agree to the Terms and Conditions via electronic signature before any reservation is final and the travel dates sent to the resort. 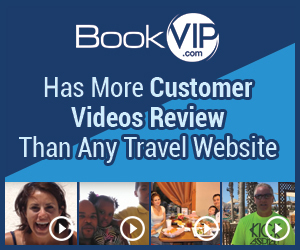 We have an A+ rating with the Better Business Bureau, send over 100,000 people on vacation per year and have more customer video reviews than any other travel site. http://bookvip.com/sitereviews. Review #736575 is a subjective opinion of User736575.